Precipitation continued across the Kenai Peninsula Sunday that helped saturate available fuels in the fire area. No smoke was visible over the area yesterday although at times you could smell smoke in the air. Firefighters checked areas of heat that were identified by the infrared equipped ScanEagle provided by Alaska Center for Unmanned Aircraft Systems. Crews and equipment that have completed the work in their assigned areas are being demobed from the fire. Dryer conditions and a warming trend is expected over the fire area today and tomorrow. The change in weather will allow fire crews to identify and extinguish any additional hot spots near the containment lines. State Senator Peter Micciche coordinated a community appreciation barbeque Sunday evening. The event provided an opportunity for community members to meet the Funny River firefighters and other first responders. The event was well attended with approximately 1500 people in attendance. The fire community is very thankful for the overwhelming support and appreciation that the local community has shown us. 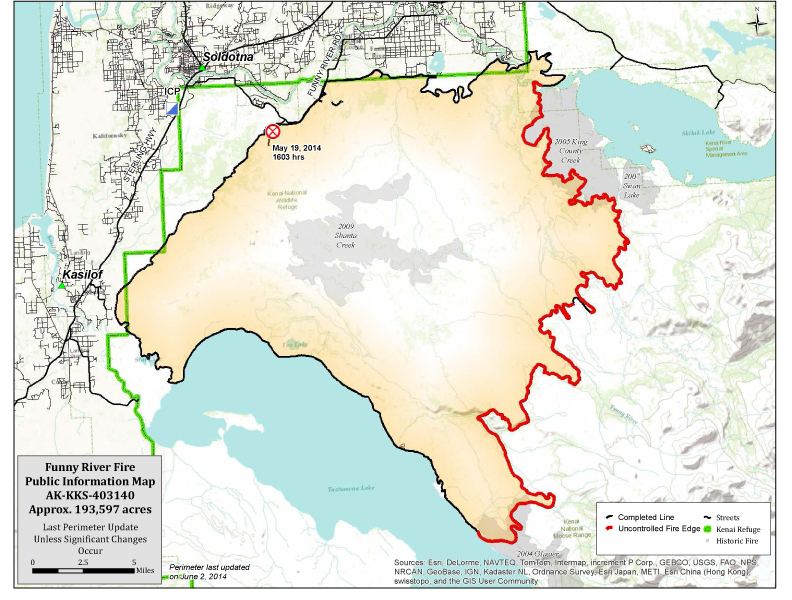 The fire grew slightly to 193,597 and is now 59 percent contained. 644 firefighters are still assigned to the incident. Residents can expect to see smoke from inside the perimeter of the fire well into the summer. A Fire Prevention Team has joined up with the Alaska Incident Management Team to provide area residents and agencies information on how to reduce the risk from future wildland-urban interface fires. To obtain further information about fire prevention and how to be firewise call (907) 631-1059. The Kenai Peninsula Borough Office of Emergency Services 24-hour call center has closed. Residents with questions or concerns can still contact the Borough at (907) 262-4910. The office is open Monday – Friday from 8:00am -5:00pm. Information is also available at http://www.borough.kenai.ak.us/emergency-mgmt/fire.